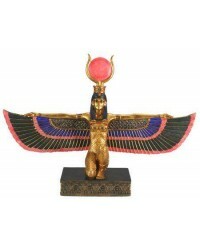 Isis is perhaps the best known and most beloved of the Ancient Egyptian Gods. She is the sister-wife of Osiris, mother of Horus, and some believe adopted as the Virgin Mary in Christian myths. Known as Aset, Auset or Eset in Ancient Egypt, she was the great mother Goddess and the Goddess of 10,000 names with many roles assigned to her. Her cult expanded worldwide into the British Isles and beyond. There are too many myths and legends about Isis to include them all here, but for those looking for more information about this beautiful Goddess, I'll briefly give you some of the more..